As WhatApp achieved much popularity due to its friendly functions, most of iPhone user download a WhatsApp on their phone. Maybe you have lots of business done on Whatsapp and leave many important information on it. What if your WhatsApp crashes and you lose all messages? Don’t worry. 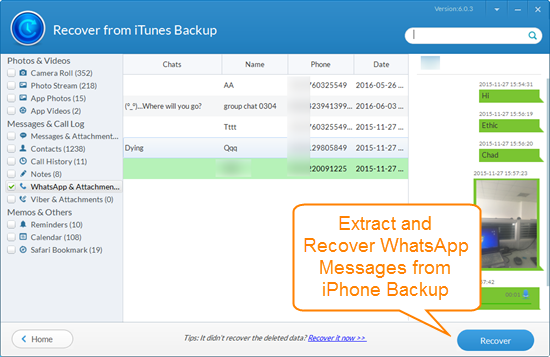 This article introduces top 4 tools to extract and recover WhatsApp messages from iPhone/iPad/iPod backup free, provided that you have an available iTunes backup. Free Jihosoft iPhone Backup Extractor enables you to have have access to view iPhone backup files and extract these data from iPhone backup in one click, including whatsApp messages, photos, videos, contacts, call logs, notes, etc. Frankly speaking, its user interface is the most friendly and comfortable. The free version allows you to extract data from unlocked iTunes backup created for iPhone 5S, 6, 6 Plus, 6S, 6S Plus, SE, iPad Air 2, iPod Touch etc. 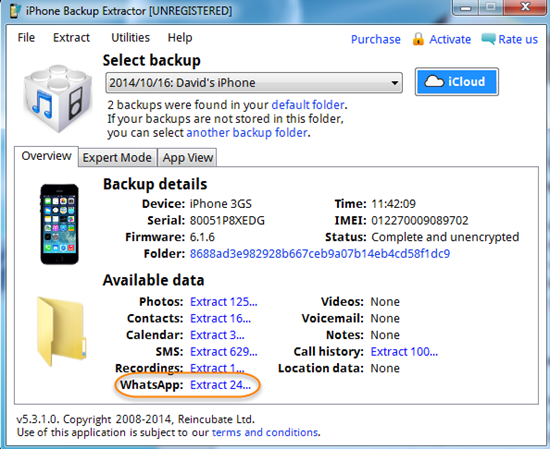 To extract/export WhatsApp messages from encrypted backup, you need upgrade to the Pro Version. Step 1: After you install this software, select an iTunes backup file that you want to extract from, then click “Next”. Step 2: Choose “WhatsApp & Attachments” to extract and recover from backup file, and type on “Next” to start scanning. Step 3: After scanning, you can carefully preview and check these messages, now click “Recover” to extract selected whatsApp messages from iPhone to computer. 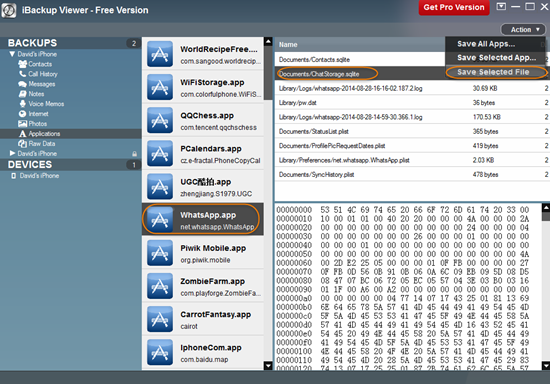 With the iBackup Viewer, you can easily extract much data including WhatsApp messages from iPhone backup. However, many of files in the scan result are not previewable. Actually, I need to recover lost WhatsApp messages but didn’t get what I want with iBackup Viewer Free. Once you have installed and launched this app, this app will automatically load your iPhone backups. Just select the messages that you want to print and click the “Action” button from the top toolbar, then select “Save to PDF”. The iPhone Backup Extractor is a powerful data recovery tool for iPhone. You can save the WhatsApp messages from iPhone backup wherever you want on computer. The exported files will be automatically saved in the form of xls. However, the free edition can only restore 4 database entries or 2 media files. What a pity! Download and launch iPhone Backup Extractor Pro on computer, select a backup file and click “App View” to select “WhatsApp Messenger”, then type on “Extract” and select a folder to save selective messages to print out. 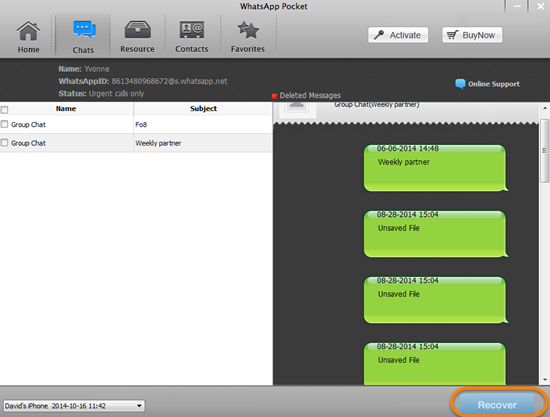 WhatsApp Pocket is specially aimed to recover and extract WhatsApp messages from iPhone backup. All WhatsApp chats history and attachments can be extracted by this tool. But you can only preview the WhatsApp messages unless you buy a pro version. And the software is not so stable when running on my computer. Install and open up whatsApp pocket on your computer, then select “Extract from iTunes Backup Files”, choose a backup file and type on the scan button. After scanning, you are now able to save whatsApp messages to computer and print them out. What if you don’t have any available iPhone/iPad/iPod backup? Tenorshare WhatsApp Recovery: It is a free tool designed to directly recover WhatsApp messages from iPhone. But you will find many repeated messages in the scan result. Jihosoft iPhone Data Recovery: If you are not satisfied with the free WhatsApp recovery, I suggest you try Jihosoft iPhone Data Recovery. It is affordable and efficiently help you recover deleted WhatsApp messages and attachments from iPhone. You are allowed to preview the data before recovery.